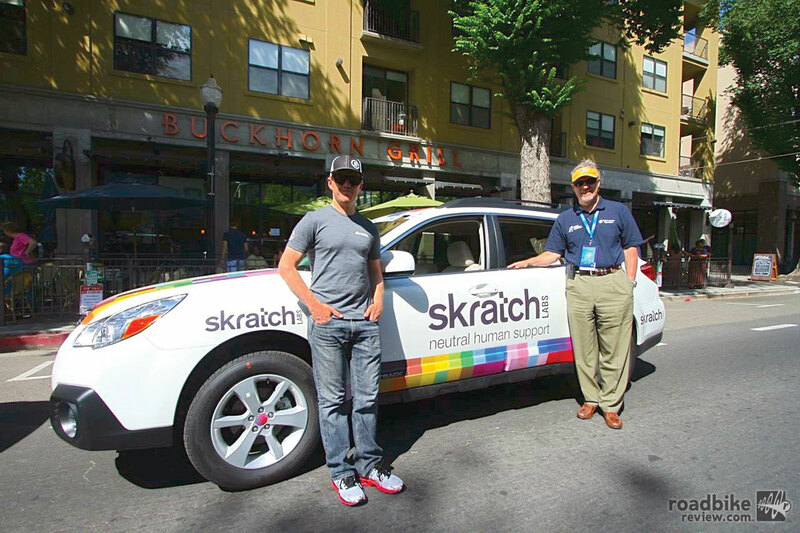 Former U.S. champ Timmy Duggan and caravan driver Jerel Schomer man the Skratch mobile at the Tour of California. Bacon, almond butter and maple syrup all wrapped in one savory rice cake; the flavor was incredible. My taste buds were firing like Danny McBride’s pyrotechnics in Tropic Thunder. As I dug in the bag for seconds, ready to stuff my face more, I thought about all those poor bastards behind me dressed in colorful lycra, gutting themselves by bike for nearly five hours at full throttle. The cross winds were fierce as I sat shotgun in the Skratch Labs Neutral Human Support vehicle, just off the front of a fully echeloned six-man breakaway during Stage 1 of the 2014 Amgen Tour of California which started and finished in Sacramento. 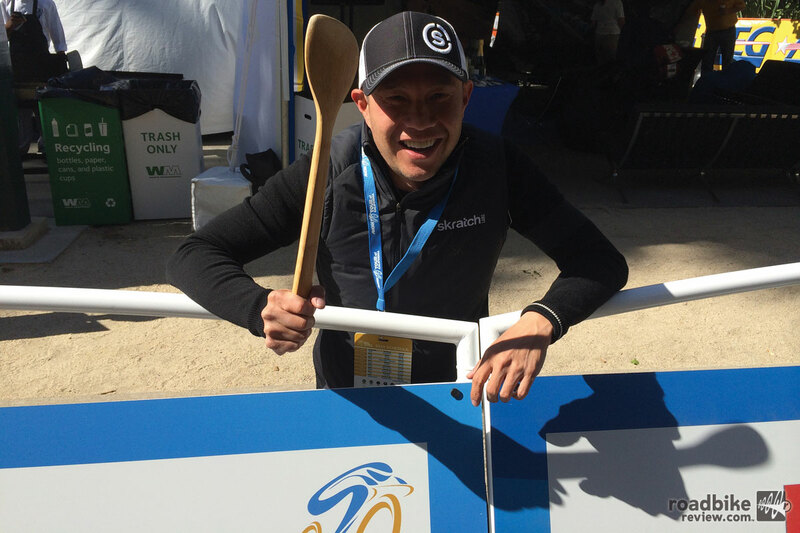 I looked back at the recently retired Timmy Duggan, 2012 U.S. national champion and now Skratch Labs employee. “Do you miss being out there,” I asked. Mapping out the day’s plan. Before last Sunday’s stage, I’d never ridden in a caravan vehicle. And nobody before last Sunday actually ever rode in a Neutral Human Support vehicle. As a new concept launched at this year’s race, the Skratch Labs Neutral Human Support program is to fueling riders as Mavic neutral support is to servicing bikes. For decades, riders have never had a problem getting whatever they needed bike or wheel-wise. Even when a rider was in a break and his team car was nowhere to be found, neutral mechanical support could save the day with a spare wheel, a derailleur adjustment, or even a complete bike. But when it came to neutral food or liquid support, getting what was needed for a rider could be more difficult. Before founding Skratch Labs, Allen Lim worked with a number of professional riders and teams as a coach and consultant. Why it took so long to figure out that neutral caloric rider support is a good idea is beyond me. But Allen Lim of Skratch Labs finally figured enough was enough, and approached race organizers with the concept of Neutral Human Support. The 120-mile opening stage in Sacramento was relatively flat, with only 3,900 feet of climbing. The temperature was actually quite pleasant for Sacramento in May with a high in the low 80s. The real challenge was the wind, with crosswinds gusting to 30 mph. The Skratch Labs moto falls back to re-up its supplies of food and drink. 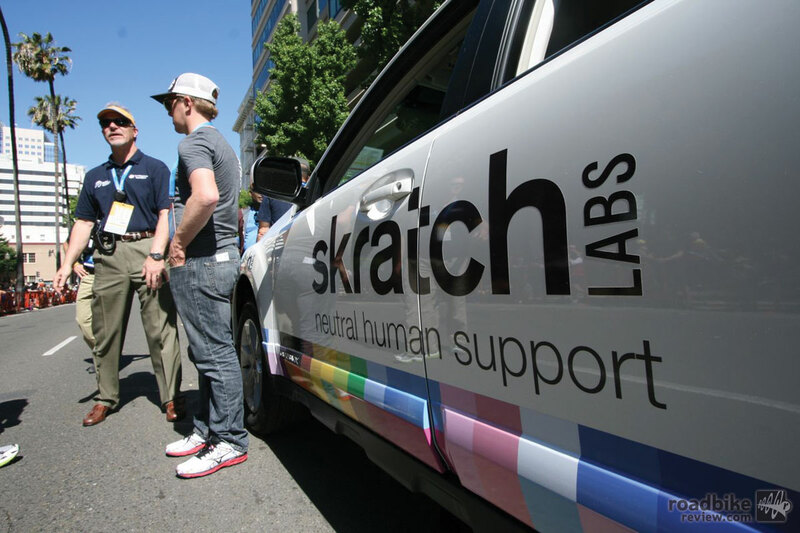 Skratch Labs had a Subaru Outback wagon and a BMW motorcycle working in tandem to support riders throughout the stage. Both vehicles were assigned to stay either off the front of the break or between any break and the peloton, helping feed riders in the breakaway. The Subaru was loaded with Skratch Labs hydration mix drink, and bags of both sweet and savory rice cakes. The aforementioned bacon, almond butter and maple syrup rice cake was the day’s savory fare; chocolate and raspberry rice cake was the sweet choice. While cramming my pie hole full of savory rice cakes, I asked Duggan how the Skratch method of cooking real food and carrying it on the bike changed his perspective on riding nutrition. 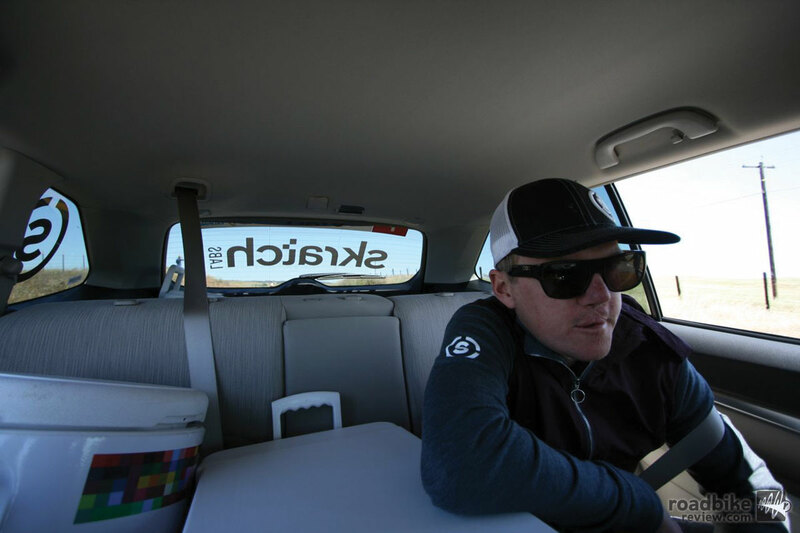 Duggan works from the backseat, passing food and drink out the windo to riders in need.